You know it’s the new year in Australia when the skies are blue and the sun’s unforgiving. It’s summer here in Australia. While some parts of the world are buried under warm duvets, Australia’s baking me alive. It’s been obscenely hot where days can get as hot as 40 degrees centigrade and it’s not letting up. As a girl from tropics, I’m generally used to this heat, but the heat’s been killing me that I thought I needed something cool to eat. Thank god I remembered this cool dish from last year’s summer anime, Kumamiko — Girl meets Bear! Machi’s Mizukake Gohan is a welcome relief during this horrible summer. Kumamiko is a lovely story about a young shrine maiden named Machi and her bear, Natsu. Having lived in a remote temple her entire life, Machi desires to study high school in the city where she can live a fashionable modern life. Natsu and the townsfolk have their worries they give Machi little challenges just to see if she’s ready for city life. It’s adorable to see Machi face her challenges while Natsu, a mountain bear, seems to know a whole lot more about WiFi and Line messaging. It’s quite a curious title as it both pokes fun and celebrates Japanese rural life. As for me, I find the series refreshing from the madness of modern anime. When I’m not in the mood for superheroes and space odysseys, Kumamiko puts me at ease. The same can be said about this recipe. This recipe of Mizukake Gohan (water-washed rice meal) was shown when Machi and Natsu wanted to eat something soothing from the summer heat. The idea of rice washed in cold water perplexed me. Not that I’ve never eaten cold rice before. Sushi’s kinda like cold rice. Onigiri in a bento’s cold too. But the idea of dousing rice in cold water with ice was just weird. Hence, I had to try it! Wash the rice in cold water until it’s loose. Drain and place in a bowl. On top of the rice, place all your toppings and as much ice that you want. 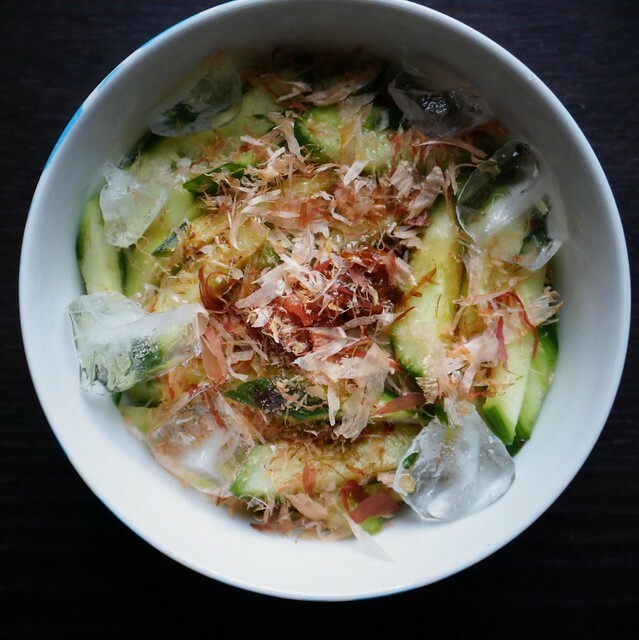 The umeboshi’s sourness cuts the dish’s savoury elements like drinking lemonade during summer. The miso and the soy sauce balance the sourness. 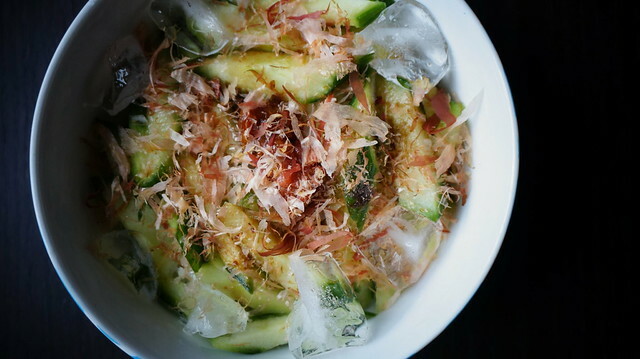 The textures from the umeboshi and the cucumber were just as awesome. And the rice, the ice-cold rice, was the perfect medium for everything. I sincerely enjoyed it and when I have the time, I’ll give Natsu’s trendy Italian mizukake gohan a try. For now, this refreshing summer rice has given me relief this summer. For folks who are enjoying the warm sunshine, this is the coolest lunch (quite literally!) you’ll have for the summer.